One of the most dramatic features of recent climate change is the decline of summer Arctic sea ice. The impacts of this summer ice loss on northern society, on Arctic ecosystems, and the climate both locally and further afield, are already being felt. Less well known are the dramatic changes in winter sea ice in regions such as the Greenland and Iceland Seas, where the reduction over the past 30 years is unparalleled since 1900, when ice records in the region began. In a study published in Nature Climate Change, we show that the loss of sea ice in this subpolar region is affecting the production of dense water that forms the deepest part of the Atlantic Meridional Overturning Circulation (AMOC). The AMOC is an ocean circulation that carries warm water from the tropics northward in the upper layers of the Atlantic with a return flow of cold water southwards at depth. As such, the effect of these changes could mean a cooler climate in western Europe. Much of the dense water in the AMOC is produced in the Greenland and Iceland Seas through the transfer of heat and moisture from the ocean to the atmosphere. The heat transfer makes the surface waters in these regions colder, saltier and denser, resulting in a convective overturning of the water column. It also serves to warm the atmosphere in this part of the world, often resulting in distinctive cloud formations seen in satellite images of the region. How much heat transfer, or atmospheric forcing, occurs depends on the magnitude of the air-sea temperature difference and the surface wind speed. As a result, it is typically largest near the sea ice edge where cold and dry polar air first comes into contact with the warm surface waters. The R/V Knorr in storm conditions near Iceland where there was a large transfer of heat and moisture from the ocean to the atmosphere. In our study, we show that the retreat of winter sea ice has led to a large reduction in the intensity of oceanic convection in the Greenland and Iceland Seas. These changes raise the possibility of less heat being transferred from the ocean to the atmosphere in these regions, resulting in a weaker AMOC, which in turn means less subtropical water brought northwards and ultimately a possible cooling of Europe. In addition to a large atmospheric forcing, oceanic convection typically occurs in regions where there is a weak vertical density contrast, usually within a closed ocean current known as a cyclonic gyre. This makes it easier for convective overturning to extend to greater depths in the ocean. 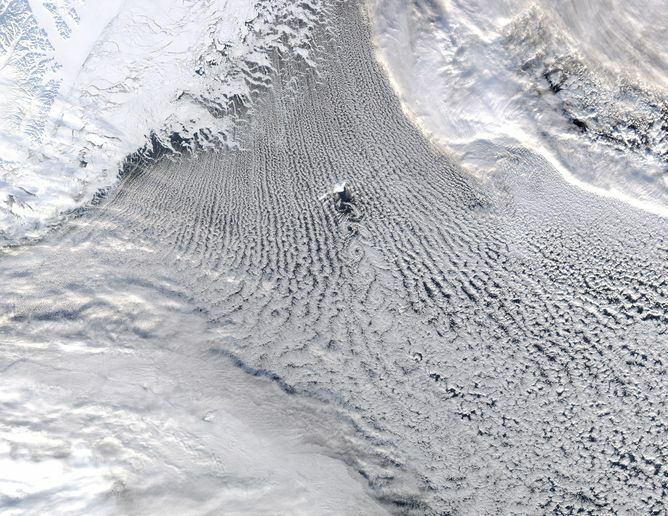 Until recently, the gyres in the Greenland and Iceland Seas that are preconditioned for oceanic convection were situated close to the ice edge and, as a result, the atmospheric forcing was large, resulting in deep convective overturning. However, the winter retreat of sea ice has now shifted the regions of largest atmospheric forcing away from these gyres. In other words, the regions where the forcing is largest and the regions most susceptible to deep ocean convection have moved apart. Since the 1970s, this has resulted in an approximate 20% reduction in the magnitude of this forcing, or heat transfer from the ocean to atmosphere, over the Iceland and Greenland Sea gyres. Winter sea ice concentration (% of surface area) in the Nordic Seas during the 1960s and the 2000s. The magenta and black curves denote the regions in the Greenland and Iceland Sea where oceanic convection occurs. 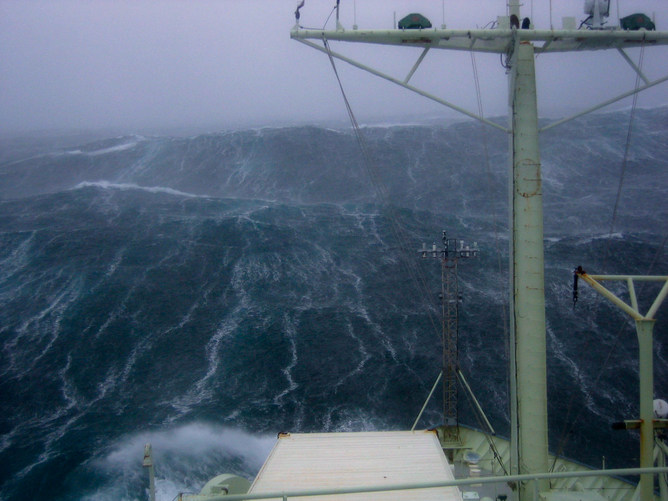 Using a mixed-layer ocean model, we have investigated the impact of this reduced atmospheric forcing. In the Greenland Sea we show that the decrease in forcing will likely result in a fundamental transition in the nature of oceanic convection there. Indeed our model results suggest a change from a state of intermediate depth convection to one in which only shallow convection occurs. As the Greenland Sea provides much of the mid-depth water that fills the Nordic Seas, this transition has the potential to change the temperature and salinity characteristics of these seas. In the Iceland Sea, we demonstrate that a continued reduction in atmospheric forcing has the potential to weaken the local oceanic circulation that has recently been shown to supply a third of the dense water to the deep part of the AMOC. Observations, proxies, and model simulations suggest that a weakening of the AMOC has recently occurred, and models predict that this slowdown will continue. Such a weakening of the AMOC would have dramatic impacts on the climate of the North Atlantic and western Europe. In particular, it would reduce the volume of warm water transported at the surface towards western Europe. This would reduce the heat source that keeps the region’s climate benign. Although there is considerable debate regarding the dynamics of the AMOC, one proposed mechanism for its current and predicted decline is a freshening of the surface waters – for instance due to enhanced meltwater from the Greenland Ice Sheet. A lower salinity reduces the surface water’s density, making it more difficult for oceanic convection to occur. However, much of this freshwater discharge is apt to be exported towards the equator via the boundary current system surrounding Greenland. This limits the direct spreading into the gyres in the Greenland and Iceland Seas where oceanic convection occurs. Further work is therefore required to determine how and where – and on what timescales – this freshwater pervades the North Atlantic. However, our results suggest that other possible mechanisms for a slowdown in the AMOC may be at work, such as a reduction in the magnitude of the atmospheric forcing that triggers the convective overturning in the Greenland and Iceland Seas. This process would also result in a slowdown of the AMOC, again reducing the warming that Europe experiences. Our results reinforce the idea that a warm Europe requires a cold North Atlantic, which allows for large transfers of heat and moisture from the ocean to the atmosphere. A warming North Atlantic with the associated retreat of winter sea ice therefore has the potential to result in a cooling of Europe through a slowdown of the AMOC. Whether these transfers continue to decline into the future is still an open question, as is their impact on the AMOC and European climate. Kent Moore is Professor of Physics at University of Toronto. Ian Renfrew is Professor of Meteorology at University of East Anglia. Kjetil Våge is Research scientist in physical oceanography at University of Bergen. Robert Pickart is Senior Scientist in Physical Oceanography at Woods Hole Oceanographic Institution.